The powerful typhoon enters the Philippines as a slow-moving, yet still dangerous storm. Children and families recovering from Typhoon Haiyan are impacted again. 400,000 children are estimated to be affected. UNICEF mobilizes relief for hard-hit areas. Typhoon Hagupit (called Ruby in the Philippines) made landfall Saturday in Eastern Samar province as a category 3 storm, bringing heavy rain and powerful winds, knocking down trees and cutting power to thousands of people. More than 30 million Filipinos live in areas that may experience winds of 120 km/h or higher, according to the Global Disaster Alert and Coordination System. While downgraded from "Super Typhoon" status, the huge storm still has the potential to cause significant damage and loss of life as it tracks across the country. The typhoon's slow pace brings with it increased risk of heavy rainfall, deadly flooding and landslides. According to the latest estimates, more than a million people are affected, including over 400,000 children. Typhoon Hagupit is expected to take several days to cross the central Philippines. Image courtesy of the U.S. Navy's Joint Typhoon Warning Center. More than 500,000 people in coastal areas, and perhaps as many as 1 million, fled their homes in advance of the storm. In Tacloban City, site of catastrophic damage by Typhoon Haiyan in 2013, families and children looked for higher ground and safety in evacuation centers like the one set up in Kapangian Elementary School, shown in the photos below, which is sheltering more than 1,000 people. 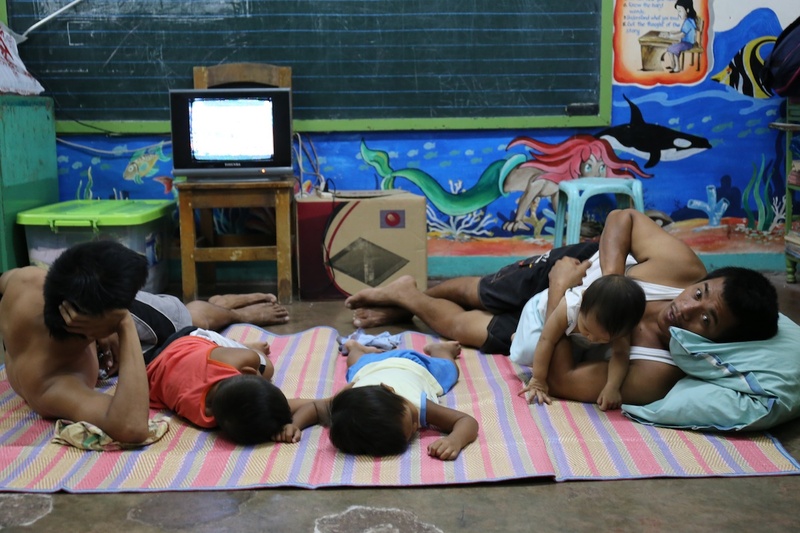 Tacloban residents also found shelter in the Astrodome, shown in this photo from the UNICEF Philippines Twitter feed. Read: Families in Tacloban have a lucky escape. Read: Typhoon Hagupit: sunny in Tacloban, stormy in Manila. While the full extent of Hagupit's impact is not yet clear, UNICEF is dispatching supplies to the Eastern Samar municipalities known to be hardest hit. UNICEF is fully prepared to assist children and families as the typhoon moves across the central Philippines. The country office is working closely with both the government and other agencies to assure that emergency efforts are coordinated and to maximize coverage in the delivery of all necessary aid. Tents; generators; and food, health care, water treatment and medical supplies were prepositioned in Tacloban, Manila and Cotabato in advance of the storm's arrival.